Hello Campers, and welcome to the second edition of Meeting the Minor Gods! We all know about the Olympians and how they came to be in power, but have you ever wondered who some of the other gods are? Today we will be learning a little more about Asclepius! Asclepius is the god of medicine and healing. He is the son of Apollo and the mortal Coronis. He was rescued by Apollo after Artemis was sent to kill his mother, she was burned on a pyre and Apollo cut him out and was given to Chiron to raise. Chiron taught him all about medicine and healing, and he became the most well-respected doctor of his time. He discovered the magical properties of gorgon blood, which was able to bring the dead back to life. This knowledge caused Zeus to kill him, In retaliation for Asclepius' murder at the hands of Zeus, Apollo killed the Cyclopes, who fashioned Zeus' thunderbolts. Asclepius was married to Salus (or Epione) and fathered six daughters: Aceso, Iaso, Panacea, Aglaea, Meditrine and Hygieia, and three sons: Machaon, Telesforos and Polidarius. His most famous sanctuary was in Epidaurus in Northeastern Peloponnese. His Roman equivalent is Vejovis. 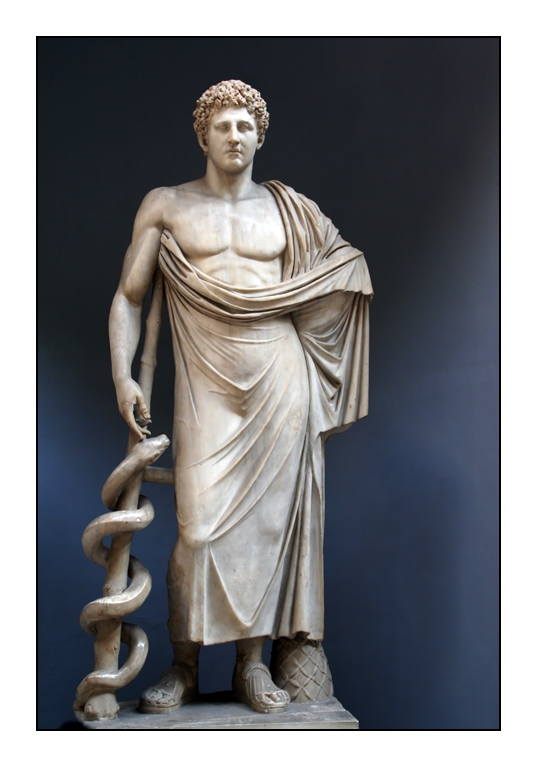 His staff, the Rod of Asclepius is often confused with Hermes’ Caduceus. The Rod of Asclepius has a single snake, whereas The Caduceus has two. His symbols are a bowl, herbs, a pineapple, a dog, and a snake. He served as the healer on The Argo. The name of his daughters each rather transparently reflects a certain subset of the overall theme of "good health". His powers include Enhanced Healing and Medical Omniscience. Catherine Smith Interesting! I can't wait to meet more Minor(-ish) Gods!